You�re viewing our Sausage Maker Fermento 1 lb. 8 oz. This product is used in the semi-dry curing process. 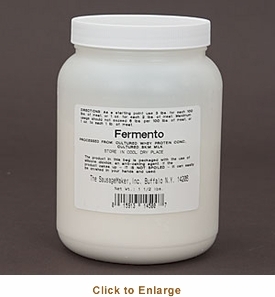 Fermento is a dairy based controlled fermentation powder for curing semi-dry sausage, it speeds up the long curing time and adds a tangy flavor to sausages. Instead of waiting through the fermentation process Fermento works quickly so you can stuff and smoke sausages soon after using. Perfect when making Cervelat, Venison Summer Sausage, Geotburg, or other summer sausages. Use 1 oz. of Fermento per 2 lbs. of meat, do not use more than 6 lbs of Fermento per 100 lbs. of meat. 1 lb. 8 oz. 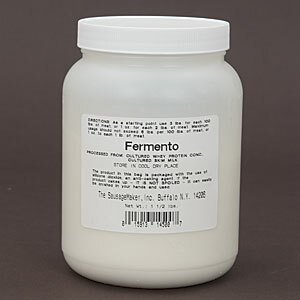 of Fermento will process up to 48 lbs. of meat. Made in USA. We can answer any questions you may have about our products. Scroll down to view our Sausage Maker Fermento 1 lb. 8 oz.